Lt. Gov. 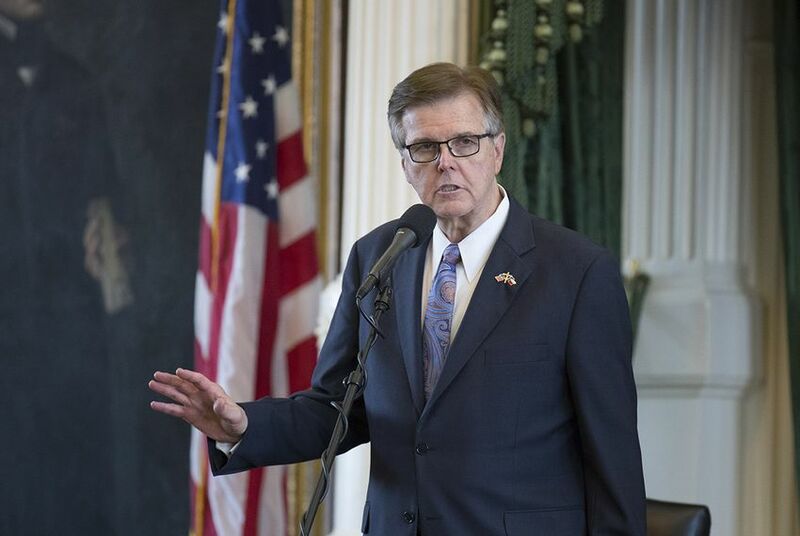 Dan Patrick isn't sold on the new House Select Committee on Economic Competitiveness, which House Speaker Joe Straus recently formed to look at the factors that draw new business to Texas. DALLAS — Count Lt. Gov. Dan Patrick among those skeptical of House Speaker Joe Straus' new push to look into Texas' business climate after the "bathroom bill" fight. "First of all, we already have the most pro-business climate in the country, and it bothers me a little bit that someone feels they have to have a committee to focus on that," Patrick told The Texas Tribune in an interview Saturday. "Rick Perry did a heck of a job on it. Greg Abbott’s done a heck of a job on it. The Texas Senate’s done a heck of a job on it. And the House has done good work." "I don't know what the point is," Patrick later said of the new House Select Committee on Economic Competitiveness. Earlier this month, Straus announced the formation of the committee and asked it to examine the factors that lure new business to Texas. The panel's launch followed a regular legislative session — and a subsequent special session — where Straus emerged as the biggest obstacle to legislation that would have regulated which restrooms transgender Texans can use, a Patrick priority that generated strong business backlash. "It’s time that we re-assert that Texas is fully committed to private-sector growth," Straus said Oct. 12 as he unveiled the committee at a breakfast for the Austin Chamber of Commerce. "There should be no ambiguity that the Texas House will focus on the big and consequential instead of the petty and the polarizing." In the interview, Patrick said it was no mystery what makes the Texas economy strong: tort reform, light regulation and low taxes. If Texas loses out on businesses, Patrick added, it will not be because of the bathroom discussion — it will be due to rising property taxes, an issue where the House and Senate failed to find consensus earlier this year. While the bathroom legislation did not prevail in either the regular or special session — it ultimately died in the House both times — Patrick said supporters of it have "already won" by sending a message to any school or business that is thinking about providing the kinds of accommodations that led to the push for the proposal in the first place. Still, discrimination protections the legislation would have nixed remain in place in major Texas cities, and some school districts are still accommodating transgender students in ways the proposals would have prevented. "We're not fixated on it — [Straus] apparently is," Patrick said of the bathroom controversy. "I wish Joe would focus on property tax relief — move on. The statute didn't pass, but the impact was the same." Straus' office declined to comment. Since the end of the special session, Straus has been giving speeches to chambers of commerce, telling them Texas avoided a "major mistake" by not passing the bathroom proposals and asking them to stay engaged in policy battles going forward. Patrick has been less vocal about the issue in recent weeks — though he has not dropped it entirely, highlighting it briefly during his speech Saturday to the Texas Federation of Republican Women. In a letter to the committee's chair Wednesday, Tinderholt said, "Many Texans are concerned that a handful of politically correct and socially liberal corporations are attempting to speak on behalf of all businesses in Texas." Patrick spoke with the Tribune after addressing the TFRW's biennial convention. In the interview, he also discussed his plans for 2018, when he's running for re-election against at least two challengers: Republican Scott Milder, a public education advocate who previously served on the Rockwall City Council, and Democrat Mike Collier, a Houston-area accountant who unsuccessfully ran for comptroller in 2014. "I take no opposition for granted, take them very seriously, no matter who they are," Patrick said. "I've seen too many incumbents in the past take challengers lightly, and so I won't take anyone lightly, and so that's going to take up a lot of my time." As for state Senate races, he said he will help some candidates raise money and "where we think we can make a difference, we may make a difference." Asked if he planned to endorse all GOP senators who are running for re-election next year — as he did ahead of the last primary season — Patrick said, "We're going to take that on a case-by-case basis." "After filing, let's see who's really in, let's see how the races are going, and we'll decide that," Patrick said. On Thursday, Patrick unveiled a long list of endorsements in his re-election campaign, including support from all Republican members of the Senate except for state Sen. Kel Seliger, an Amarillo Republican who was at odds with Patrick on some of his priorities during this year's legislative sessions. Patrick said he had called Seliger to "give him the courtesy of knowing the other 19 senators had endorsed me," and he said Seliger made clear he wanted to focus on his own race. Seliger is facing primary challenges from Amarillo restaurateur Victor Leal and former Midland Mayor Mike Canon, who came within 5 percentage points of unseating Seliger in 2014. Patrick said he told Seliger "that I have no intention of being involved in his primary."